Monday Blues…. it is the “ahhhhh no” day for me. I just had the two most glorious days.. Saturday and Sunday… spending the whole day with my son and hubby… doing what ever I like… lazying on bed for as long as I need…. So to overcome my Monday blues, I start my day listening to good music. I love listening to Rafi. My favorite songs are “Chaudavin Ka Chand Ho” and “Baharon Phool Barsaao” sung by him, such a wonderful songs with wonderful lyrics …. can a day start better than this!! Usually on Mondays I cook which is very easy, which takes very less time and effort. The recipe I am sharing with you is one such dish which is simple yet delicious and goes well with Roti or Steamed rice. Add oil in a large pan. After it is hot, add mustard seeds and jeera. After the mustard seeds splutter, add curry leaves, chopped ginger and sliced onions and turmeric. Fry for a min or two, and add the ground masala powder. 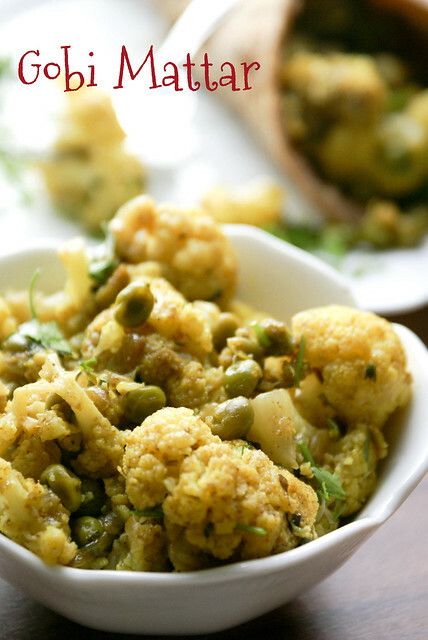 Fry for few mins, and add cauliflower and peas. Mix, and add salt and red chilli powder. Mix well. Cover and cook for 10 minutes on low heat. Remove the lid, increase the heat to high, and saute for few more minutes till the moisture disappears. Adjust salt. Add the coriander leaves. Serve with Roti or Steamed rice. You can also make this as a gravy, by adding a tomato paste or by adding cashew paste. For extra crunchiness, you can add some peanuts. Happy Cooking and Have a Fabulous Monday!!! Let me know how you deal with Monday Blues. 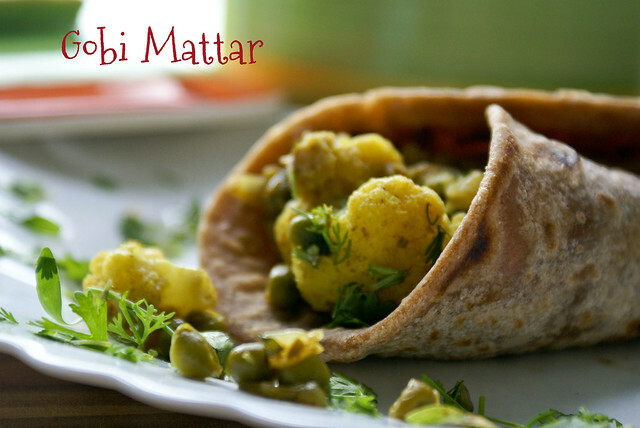 Gobi Mattar looks so yummy…loved the casserole as well along with the roti wrapped stirfry….Lovely looking blog you have..
Gobi matar is one of those comforting indian dish and I love it. I have it in my blog too but loving your version more. What a nice simple dish with great flavour. My kind of stir fry, can have it with anything..delicious! @Sharmilee.. I am glad that you liked. @Aarthi… Thanks, and I am glad I found ur space too , its very nice. Spandana,regarding ur q'n about peach jam,i didnt went for food preservative,coz its completely trying to avoid them, this jam without any preservative stay for a month if u conserve them correctly..Hope this helps..
Gobi mattar looks so inviting.Love to have this with paranthas. First time here and absolutely love your presentation and photos. 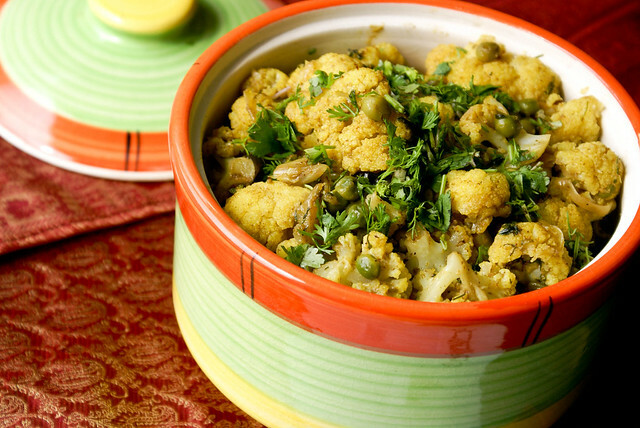 Gobi Mattar looks simply superb. You have a wonderful blog here, beautiful photography! Loved this recipe as well! The clicks are so tempting that they make me hungry!! !